Glitter brush paint is an intense glitter finish that provides multi-dimensional shimmer and sparkle. Can be applied to drywall, wood, metal, plastic and hardboard. Formulated to provide a decorative glitter finish to most interior surfaces. Dries to the touch in 1 hour, to handle in 2 hours and fully dry in 2-4 hours. LePage. Polyfilla. Wall Paint Preparation is a ready to use, extra fine patching compound for repairing surface damage to interior walls. Ideal for smoothing surface imperfections and filling shallow cracks and holes. The creamy, off-white paste spreads easily, dries fast and sands to a super fine finish that is smooth, hard and dent resistant. It has low odour and wet filler can be easily cleaned with water. Polyfilla. Wall Paint Preparation is also paintable and sandable once fully dry. OLYMPIC WATERGUARD Clear Wood Sealer has been specially designed to provide four-way protection that restores the natural beauty of your outdoor wood. A clear finish allows your wood to weather and grey naturally. Ideal for deck, fences, outdoor furniture, railings and siding. One coat is sufficient for maximum protection. Rust-Oleum Chalked Ultra Matte Paint creates an ultra matte finish with superior adhesion and coverage. It rejuvenates furniture and home dicor with timeless elegance. It can be painted or distressed, giving any project a one of a kind look with a vintage feel. 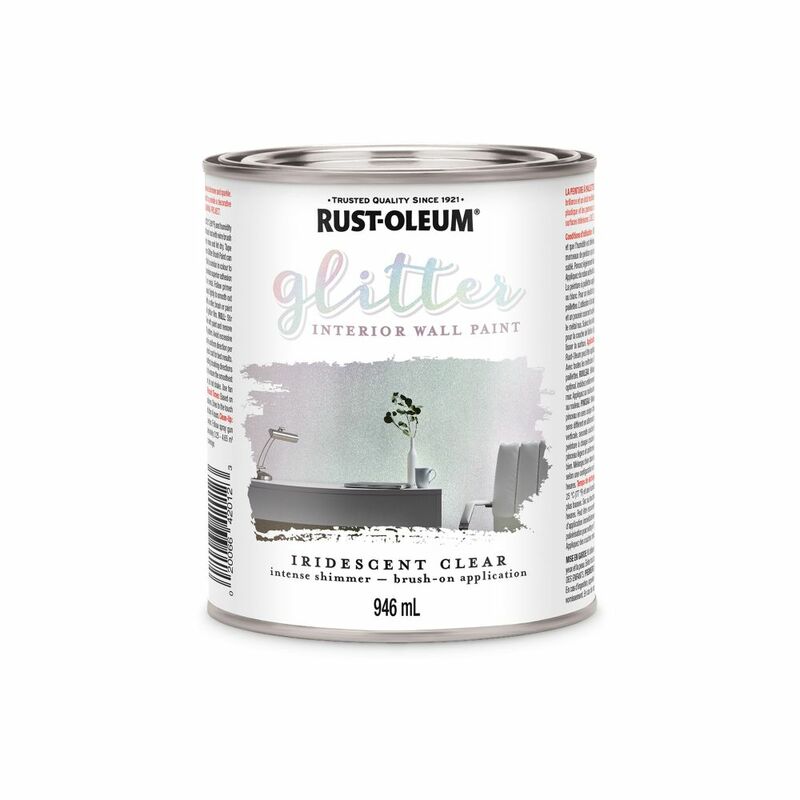 Rust-Oleum Interior Wall Paint Iridescent Clear 946ml Glitter brush paint is an intense glitter finish that provides multi-dimensional shimmer and sparkle. Can be applied to drywall, wood, metal, plastic and hardboard. Formulated to provide a decorative glitter finish to most interior surfaces. Rust-Oleum Interior Wall Paint Iridescent Clear 946ml is rated 1.0 out of 5 by 1. Rated 1 out of 5 by Emster from Glitter Paint Club While we were painting, my partner said: “First rule of sparkle painting, don’t buy sparkle paint!” We loved the concept for our bathroom ceiling. The Home Depot associate promised it would work. I bought DOUBLE the amount they suggested, as I couldn’t see that little can covering our 350 sq. ft. bathroom. We threw both cans up there tonight. And it will be beautiful when it’s done. One day. But we will need double - or triple - what I bought. Meaning this will cost us between $130 - $205 to paint a freaking bathroom ceiling. Had I known this from the beginning, I wouldn’t have started. What a pain in the keister. Does this paint cover the walls as a stand alone product or are you supposed to put another paint under this and this is a clear glitter cover?